One of the many benefits of Yoga hand mudras is weight loss. Mudras are in practice since the beginning of Hindu and Buddhist traditions and they’re used in treating various mental and physical health issues. Hand mudras are very commonly seen in various Hindu deity statues, especially Varada mudra and Gyan mudra. The word ‘mudra’ is a sanskrit word that is referred to as seal. The yoga mudras help seal or affirm an idea or intention. 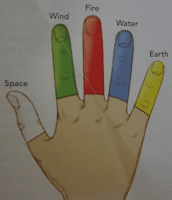 When the hand and fingers are positioned together in a pre-defined way, it generates some form of energy (prana force), which helps in healing of several ailments including overweight problems. Since, five elements are associated with our five fingers, practicing yoga mudras or hand gestures regularly can yield several health benefits. If you’ve read the Yogic philosophy, it is evident that specific internal organs have been assigned to each of the fingers and when you hold the fingers in a specific manner, it will activate the corresponding internal organ, thereby curing the related problems, which include reducing body fat, normalizing blood pressure, curing mental illness and even improving your heart health. Here is a list of the most effective yoga mudras to lose weight. The good thing about hand mudras is that they don’t have any side effects and can be followed along with other weight loss diets/programs such as the GM diet. There are five different types of yoga mudras that help in losing weight by activating the corresponding organs in the body. Surya mudra increases the agni (fire) element and at the same time decrease prithvi (earth) element within the body and hence it is also called by another name ‘Agni-Vardhak mudra’. According to ayurveda, indigestion is the major cause for obesity, overweight and excess body fat. Since, the fire element helps in improving the digestive power, it is therefore believed that Surya mudra could help treat obesity problem naturally. 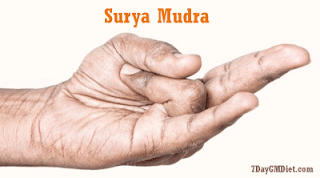 How to Perform Surya Mudra? Place the tip of your ring finger on the base of the thumb and apply gentle pressure on the ring finger with your thumb. 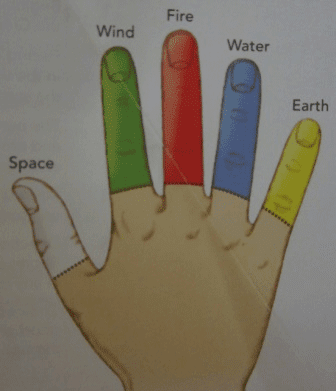 When you put your ring finger (earth element) under the thumb finger (fire element), it decreases the earth element (corresponds to fat) and the fire element is increased (improves digestion). So, you’re getting double benefits using a single hand mudra. P.S: Excess of earth element (prithvi) leads to excess fat accumulation and overweight issues. Practicing Surya mudra regularly can help decrease the earth element in your body. The sanskrit term for Linga is ‘phallus’ (male genital organ). As it reinforces the Agni and pitta humor, the mudra increases bodily heat, thereby helps in weight loss. 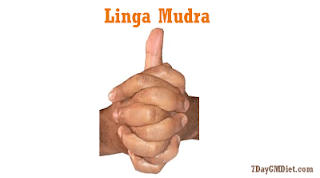 How to Perform Linga Mudra? Interlock both the palms but keep the left thumb erected outwards & upwards to form the phallus. Since the thumb finger represents fire element, practicing this mudra regularly will increase the agni in your body and thus enhances your digestive power. Proper digestion prevents the formation of toxins like ‘Ama’ and hence your body burns stored fat automatically. Pitta-Kaarak or Kapha Nashak mudra is a combination of fire and water elements i.e., agni and jal. Hence, it gives you double benefits – fire improves digestion and earth reduces the body fat. How to do Pitta-Kaarak or Kapha-Nashak Mudra? Place the ring and little fingers on the base of your thumb finger and apply gentle pressure on these fingers. 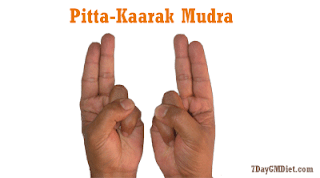 This yoga mudra helps in decreasing the kapha humor and at the same time increases the pitta humor within the body. P.S: If you’ve excess pitta (heat) in your body, it is advised to practice this mudra in moderation, if really necessary. 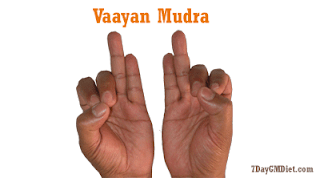 The Vaayan mudra increases the vata humor, due to which it is also called as ‘Vata-Kaarak mudra’. How to Practice Vaayan Mudra? Just place the tips of your index (air) and middle finger (sky) on the tip of your thumb finger (fire) and apply gentle pressure. This particular hand mudra not only helps in fat loss but also cures various health issues mentioned above. Gyan mudra may not directly help in weight loss but can aid in relieving mental stress that is linked to overeating. So, it is highly advised to practice this hand mudra to relax your body and avoid stressful lifestyle. 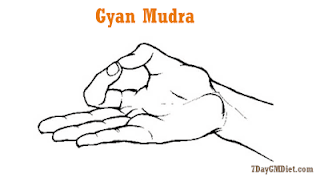 How to Perform Gyan Mudra Correctly? t is usually performed along with meditation or yoga asanas. Sit in either Sukhasana (easy pose), Vajrasana (diamond pose) or Padmasana (lotus pose) according to your own comfort. Make sure that you keep your back straight, while the chest and head are held up high. Rest both your hands on their respective knees with your palms facing upwards. Touch the tip of your thumb and index finger, while the rest of the fingers are kept straight and parallel to each other. Apply gentle pressure on both the index and thumb finger to generate the energy that helps in relaxing your body and reducing the stress. You can even chant the mantra ‘aum’ along with inhale & exhale. The Gyan mudra is not only meant for those who’re looking to lose weight but also for those who wanted to improve their concentration levels and lead a peaceful lifestyle. All these Yoga hand mudras for weight loss are proven to be very efficient and are suggested by Ayurvedic experts to those who’re suffering with obesity or overweight issues. Next Post:How Many Liters of Water to Drink Each Day to Improve Overall Health?